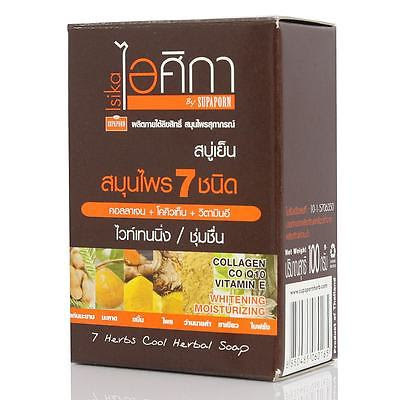 Cooling Herbal Soap is formulated from 7 Thai Herbs; Tamarindus Indica Heart Wood, Artocarpus Lakoocha Heart Wood Powder, Curcuma Longa Rhizome Powder, Zingiber Cassumunar Powder, Curcuma Aromatica Powder, Camellia Sinensis Leaf Powder, Psidium Guajava Leaf Powder. These natural ingredients will help deeply cleanse and nurish to reveal a silky feeling, white, and radiant skin. After showering, you will experience the naturally refreshing aroma and a smoother skin. Borneol, BHT, Etidronic Acid, Sodium Lactate, Sodium Gluconate, CI 19140, Collagen, Tocopheryl Acetate, Tamarindus Indica Heart Wood, Lakoocha Heart Wood Powder, Curcuma Longa Rhizome Powder, Zingiber Cassumunar Powder, Curcuma Aromatica Powder, Camellia Sinensis Leaf Powder, Psidium Guajava Leaf Powder,Phosphorous Acid, CI 60725, Arbutin, Ubiquinone.